Today, due to an infection I am having trouble ridding myself of I had a craving for something comforting and sweet but also fresh and green. 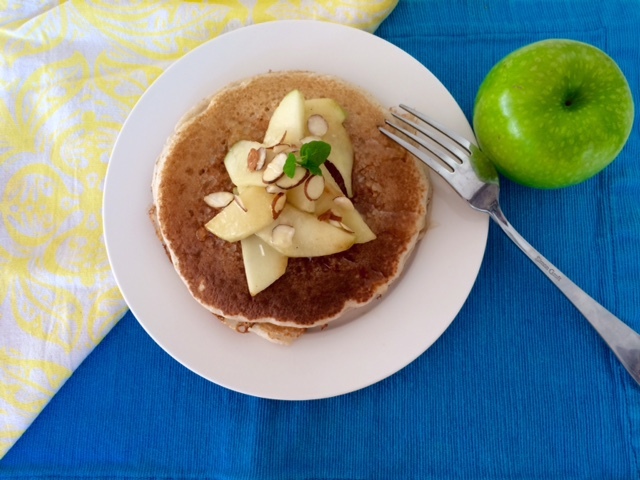 I remained true to the sattvic diet while also satisfying those needs and nourished myself with buckwheat pancakes topped with slice green apples sautéed in a little butter and cocoanut sugar and drizzled in manuka honey and sliced almonds. With a mind fogged with painkillers and a body starting to feel quite weary with chemicals I decided that the benefits of a yoga class would outweigh and discomfort I might experience and I was right. Nothing eases mental and physical discomfort like a series of beautifully guided asanas, the skill, authenticity and care of your teacher and the combined energy of your yoga community.